Ethereum succumbs to the bearish pressure. Ethereum has lost over 3% since the start of the day to trade at $455 to press time. The second largest coin by market value is under pressure due to Bancor hack attack that saw Ethereum tokens worth around $12.5M and about $10M worth of BNT tokens stolen by thieves. “This morning (CEST) Bancor experienced a security breach. No user wallets were compromised. To complete the investigation, we have moved to maintenance and will be releasing a more detailed report shortly. We look forward to being back online as soon as possible,” the company posted on the Twitter account. Bancor claims that once the theft was identified, they managed to freeze $10 million worth if BNT and thus limit the damage. The exchange is working with other cryptocurrency exchanges to trace the stolen Ether. However, the community is concerned about Bancor prospects and doubts if the exchange is truly decentralized. Bancor case is just another evidence that criminals have set their eyes on cryptocurrency trading platforms. According to the latest report by Ernst & Young, hackers stole about 10% of the funds raised during ICOs. 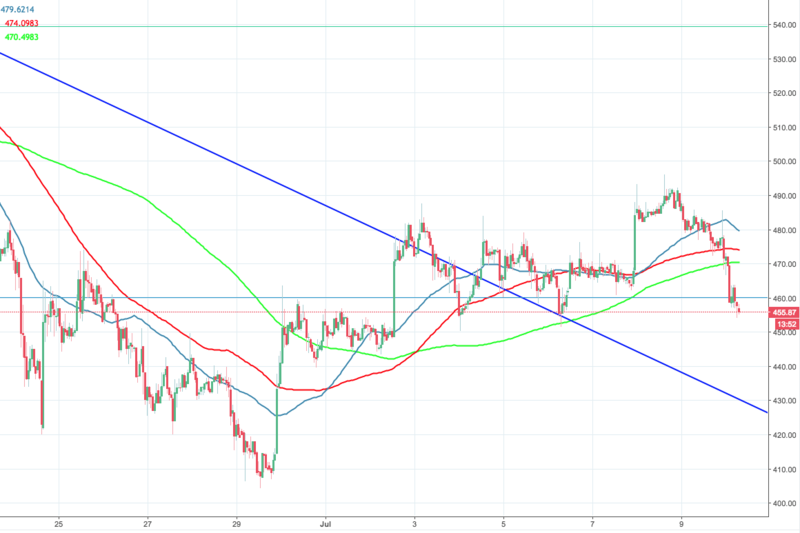 Looking technically, ETH/USD needs to get back above $460 and $470 (200-SMA, 1-hour chart) to get a chance for an extended recovery. Otherwise, the selling pressure may push the coin towards $430-$420 support area.